William Arthur Phillips was born in Yeovil but I could find hardly any records for him at all. In the spring of 1915 a William Phillips married 49-year old Alma Reader at Yeovil, but whether or not it was 'the' William in question is not known. If he had been the same age as Alma he would have been too old to enlist, on the other hand he may have been ten years or more her junior and just managed to enlist at the upper age limit of 37. Sadly, that is all I could find out. Although it known that William enlisted in the Regular Army, in the 1st Battalion, Somerset Light Infantry, at the home barracks in Taunton, it is not known when. However, from his Service Number 38299, it was most likely during 1916. In 1916 the 1st Battalion had moved south and were in action during the Battles of the Somme. Having been through so many battles, it would appear that William Phillips died from wounds received in the daily horrors of trench warfare on 21 March 1918. 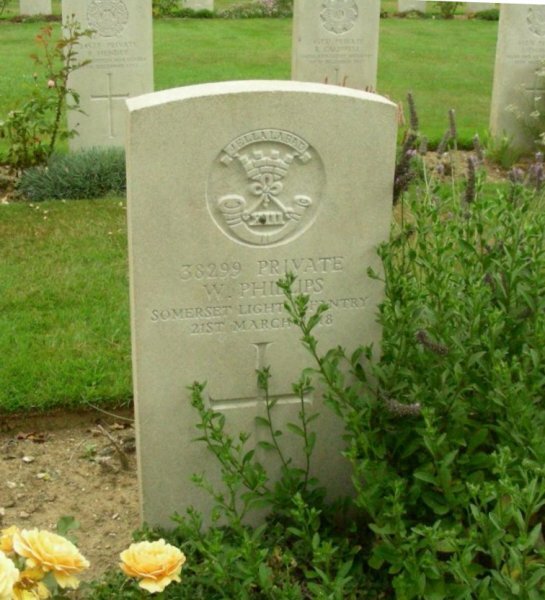 On 5 April 1918 the Western Gazette reported "Private W Phillips, of the Somerset Light Infantry, whose parents live at 19 Great Western Terrace, has died as a result of wounds received in action in France on the 22nd March. Much sympathy is felt for the bereaved parents." 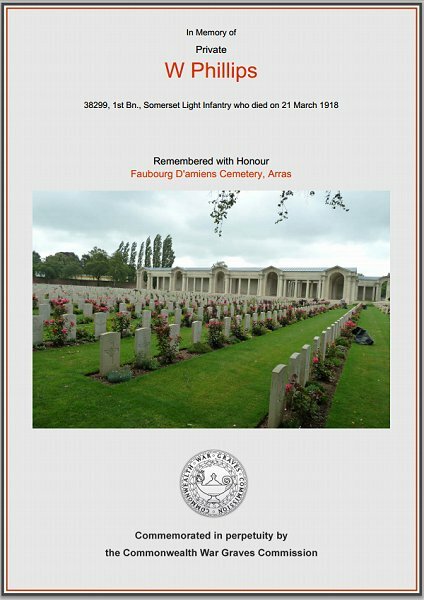 William was interred at Faubourg D’Amiens Cemetery, Arras, Pas de Calais, France - Grave VII.B.10, and his name is recorded on the War Memorial in the Borough. The Commonwealth War Graves Commission certificate in memory of William Phillips.